There have been plenty of eye-catching stories in the energy industry this year, but one notable development has been the rise of the U.S. as a crude oil exporter. The ban on crude exports from the U.S. was lifted at the end of 2015, and exports ticked up in the following year, but only modestly. 2017, however, was the year that the floodgates opened. In the first half of the year, there were several weeks when the U.S. topped 1 million barrels per day (mb/d), but exports averaged about 750,000 bpd between January and June. In the third quarter, the export machine really kicked into high gear, and Hurricane Harvey was arguably the spark. It may seem odd at first blush that a disastrous storm that ravaged Texas would be the thing that spurred a rise in U.S. oil exports, but because so many refineries were damaged, a lot of the oil produced in Texas had to go elsewhere. U.S. oil exports hit a high at 2.133 mb/d in the last week of October, and have fallen back a bit since. In fact, it would seem to be a struggle for the U.S. to maintain such a high level of shipments. The more oil that is exported, the more likely the discount between WTI and Brent would narrow, which would essentially eat away at the competitiveness of U.S. crude. Nevertheless, the U.S. has averaged exports of 1.5 mb/d in the fourth quarter, which is very high historically and makes the U.S. a significant player in the global oil market. At that level, the U.S is shipping more oil than 6 of the 14 OPEC members. Moreover, even as U.S. oil exports may ease a bit next year, there are some forces working in its favor. The WTI discount remains exceptionally large, with front-month prices still trading almost $7 per barrel lower than Brent. That will keep exports high. Argus Media notes that transport costs of very large crude carriers (VLCCs) run at about $3.75 per barrel, which means the differential between WTI and Brent is supportive of U.S. exports. The discount is helped along by the fact that U.S. shale output is surging, which acts as a drag on WTI. The EIA predicts that the U.S. will average 9.9 mb/d in 2018, an all-time high. OPEC and other analysts expect growth of U.S. shale by about 1 mb/d; the IEA sees slightly less but still robust growth of about 870,000 bpd. In addition, the longer the discount stays in place, the more likely the U.S. holds onto some customers even after the discount narrows. Argus Media reports that refiners from South Korea, India and Poland are beginning to make purchases of American crude, replacing barrels that typically come from the Middle East. Refiners in these countries recently booked initial cargoes from the U.S. ahead of several more purchases scheduled in subsequent months. Another reason why exports could remain elevated is that more crude export terminals are set to come online in 2018 and 2019. The Louisiana Offshore Oil Port (LOOP) is making changes to its facility in order to handle VLCCs, which will expand the ports capacity and lower the cost of export. That upgrade is slated to reach completion in early 2018. 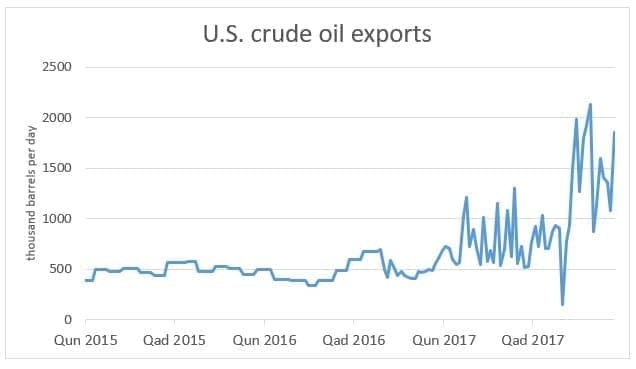 U.S. oil exports surged in 2017, and 2018 could see more of the same. US export can only get higher.So what.Export was much higher when price was 150 per barrel. This article is misleading because it doesn't mention the fact that the US is still IMPORTING around 10 mb/d (exactly 9.661 mb/d in October 2017 according to the EIA) which makes it, and by far, a net oil importer.